I first heard people talking about Z39.50 back in 1994 when I went to my first conference of librarians, Access ‘94 in St. John’s, Newfoundland. At that conference, at at other Access conferences I attended in later years, there always seemed to be at least a few sessions about Z39.50. Like “Z39.50 for finding it all” at Access 2002 in Windsor. To me, a non-librarian, Z39.50 seemed like the darkest of dark library arts: a secret language that librarians whispered to their systems, out of earshot of we civilians. That it had such an arcane name only reinforced this. Simply by osmosis over those years, I’ve managed to deduce that Z39.50 is a protocol for speaking to library catalogues: in the same way that our web browsers speak to our web servers using a protocol called HTTP, library clients can talk to library catalogue servers using Z39.50. Z39.50 may be a dark art, but it’s an open dark art, and most automated library systems will respond to you if you talk to them using the protocol. To speak Z39.50 you need a client – a program that will communicate via Z39.50 with a catalogue – along with the IP address and port number of the server. This will, among other things, leave you with a command line client named yaz-client. And then it sits there, waiting for a command. 100 1  $a MacLauchlan, Wade, $e author. 245 10 $a Alex B. Campbell : $b the Prince Edward Island premier who rocked the cradle / $c H. Wade MacLauchlan. 264  1 $a Charlottetown, Prince Edward Island : $b Prince Edward Island Museum and Heritage Foundation, $c 2014. 300    $a 410 pages : $b illustrations ; $c 24 cm. 504    $a Includes bibliographical references and index. 651  5 $a Prince Edward Island $x Politics and government $y 1959-1979. 650  0 $a Premiers (Canada) $z Prince Edward Island $v Biography. 650  0 $a Politicians $z Prince Edward Island $v Biography. 710 2  $a Prince Edward Island Museum and Heritage Foundation, $e issuing body. 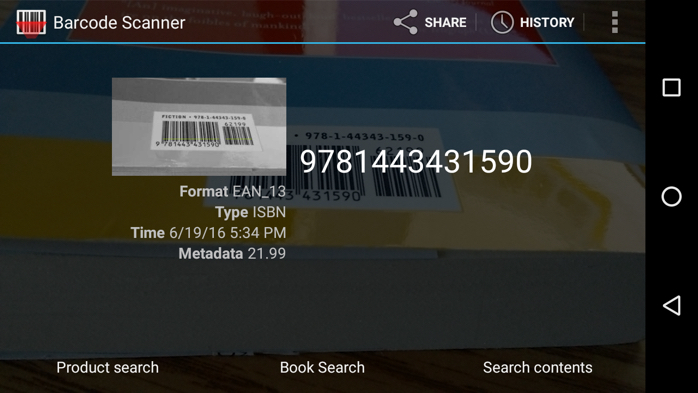 tells us that the call number for this book – what you’ll use to find it on the shelf — is PEI 921 CAM. And, sure enough, that’s what the online public catalogue tells us too. tells us that there’s a copy that was checkout out (CHECKEDOUT) from the Confederation Centre Public Library in Charlottetown (CHA) that’s due back on July 5, 2016 (5/7/2016). Dark arts though Z39.50 and and the MARC format be, they are well-documented, structured data, and that’s gold for someone who’s interested in automated interactions with a library catalogue. 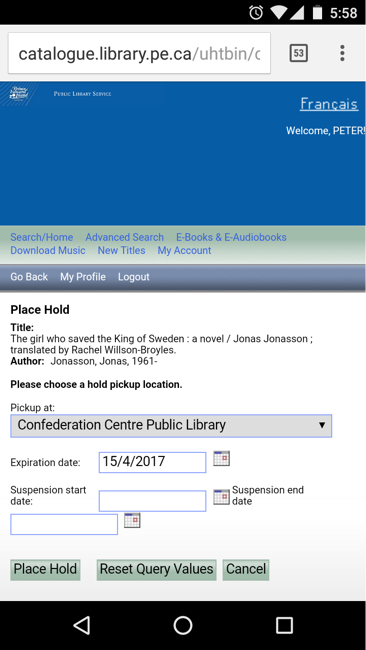 245 14 $a The girl who saved the King of Sweden : $b a novel / $c Jonas Jonasson ; translated by Rachel Willson-Broyles. 246 1  $i Pre-publication title was given as: $a Illiterate Who Could Count. 260    $a New York : $b Ecco Press, $c c2014. 300    $a 387 pages ; $c 24 cm. 336    $a text $b txt $2 rdacontent. 337    $a unmediated $b n $2 rdamedia. 338    $a volume $b nc $2 rdacarrier. 520    $a "In a tiny shack in the largest township in South Africa, Nombeko Mayeki is born. Put to work at five years old and orphaned at ten, she quickly learns that the world expects nothing more from her than to die young, be it from drugs, alcohol, or just plain despair. But Nombeko has grander plans. She learns to read and write, and at just fifteen, using her cunning and fearlessness, she makes it out of Soweto with millions of smuggled diamonds in her possession. Then things take a turn for the worse... Nombeko ends up the prisoner of an incompetent engineer in a research facility working on South Africa's secret nuclear arsenal. Yet the unstoppable Nombeko pulls off a daring escape to Sweden, where she meets twins named Holger One and Holger Two, who are carrying out a mission to bring down the Swedish monarchy...by any means necessary. Nombeko's life ends up hopelessly intertwined with the lives of the twins, and when the twins arrange to kidnap the Swedish king and prime minister, it is up to our unlikely heroine to save the day--and possibly the world"--from publisher's web site. 650  0 $a South Africans $z Sweden $v Fiction. 650  0 $a Nuclear weapons $v Fiction. 650  0 $a Twins $v Fiction. 651  0 $a Sweden $x Kings and rulers $v Fiction. 700 1  $a Willson-Broyles, Rachel. Z39.50 is open data in its finest form, and our Provincial Library System’s catalogue has been speaking Z39.50 for many years. We owe a debt of gratitude to librarians past and present for breaking the trail. Written June 19, 2016 at 6:01 p.m.
Glad you're re-kindling the love of Z39.50! Indeed, we at UPEI use it too, our connection details are here: http://library.upei.ca/z3950 .